Shopping for Thor Action Figures? The Mighty Thor Odinson, heir to the King of the Gods, is descended to the human world of Midgard! In this Variant Play Arts Kai series, Thor's godly aspect has been captured in every detail of his physique. Thor measures 11-inches tall x 8 1/3-inches wide x 4 1/3-inches long, comes with display stand, and is packaged in a window box. The contours of his ornamental armor are accentuated by careful paintwork. Each detail of his costume stands out from the next for an artistic finish to this figure. Mjolnir, a mighty hammer that can only be held by one worthy of the power of Thor, has been exaggerated in its size. Our aim was to convey the sense of power imbued in this iconic Asgardian weapon. 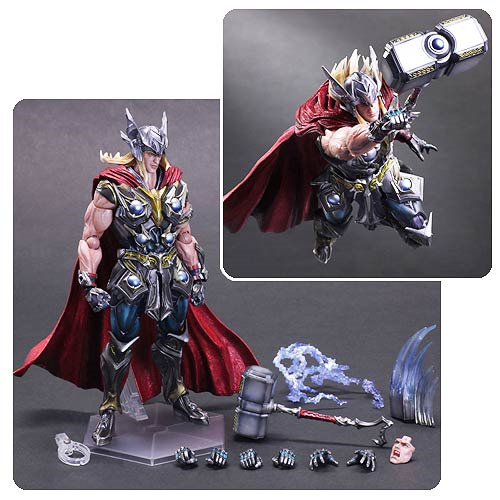 Whether calling down a bolt of lightning or pulverizing his enemies with a swing of his hammer, this mighty God of Thunder can be dynamically posed by combining the wide range of included accessories. This figure also includes an accessory with an alternate facial expression of rage, to reflect his brash personality. Ages 15 and up.